Cut zucchini slices into quarters. Heat 10- or 8-inch nonstick skillet with sloping sides (omelet pan) over medium heat. Add zucchini and remaining filling ingredients; cook 4 to 6 minutes, stirring occasionally, until tender. Remove cooked vegetables from skillet; place on plate and cover to keep warm. Cool skillet 1 minute; wipe clean with paper towel. In small bowl, mix egg product and milk. Heat same skillet over medium heat. Pour egg mixture into skillet; cook 4 to 5 minutes without stirring but lifting edges occasionally to allow uncooked egg mixture to flow to bottom of skillet, until mixture is set but top is still moist. Spoon cooked vegetables onto half of omelet; sprinkle with cheese. With wide spatula, loosen edge of omelet and fold over vegetables. 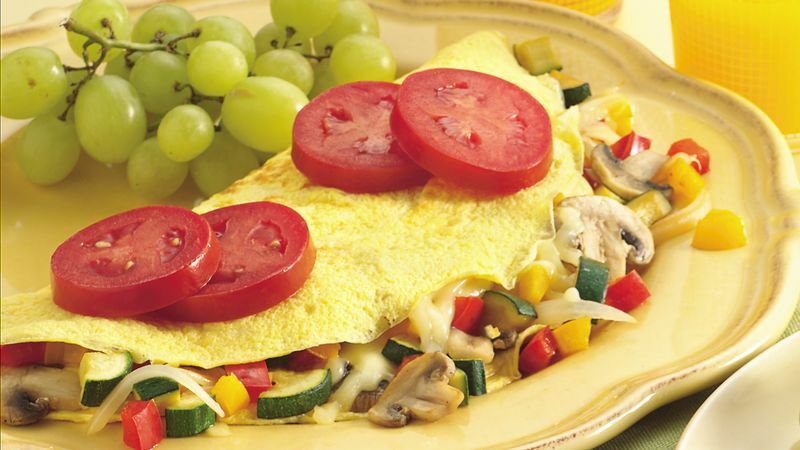 Arrange tomato slices on top of omelet.